Whether you are buying, selling or mortgaging real estate, you can rely on the experience of John Paul Corrent and his courteous, well trained staff to serve you professionally, promptly, and affordably. You need someone who can give you sound and problem solving advice, aggressive representation, access, regular reporting to keep you informed, and most importantly RESULTS. 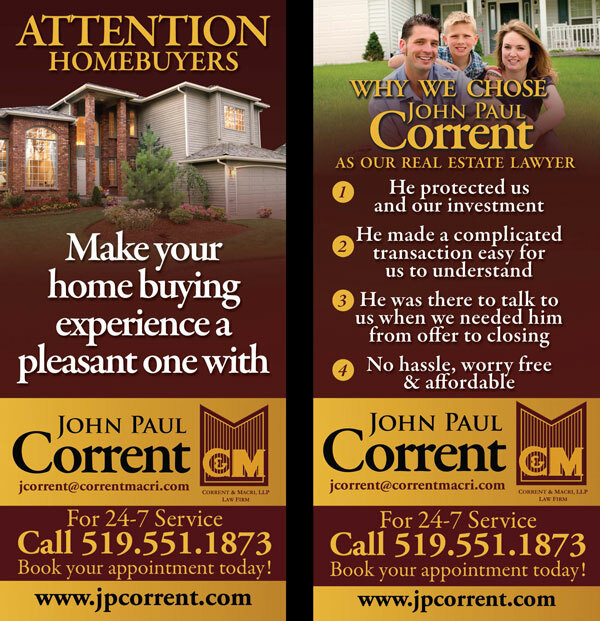 John Paul Corrent has proven experience in residential lot, condominium, and commercial/industrial development, commercial financing, leasing, proper corporate structuring, and effective representation before Municipal and Provincial boards and agencies.